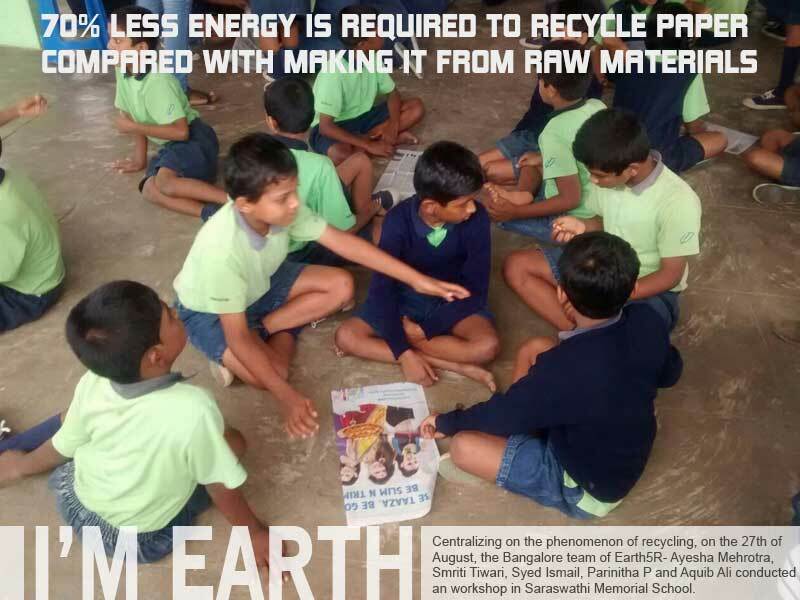 Were you aware of the fact that 70% less energy is required to recycle paper compared with making it from raw materials? 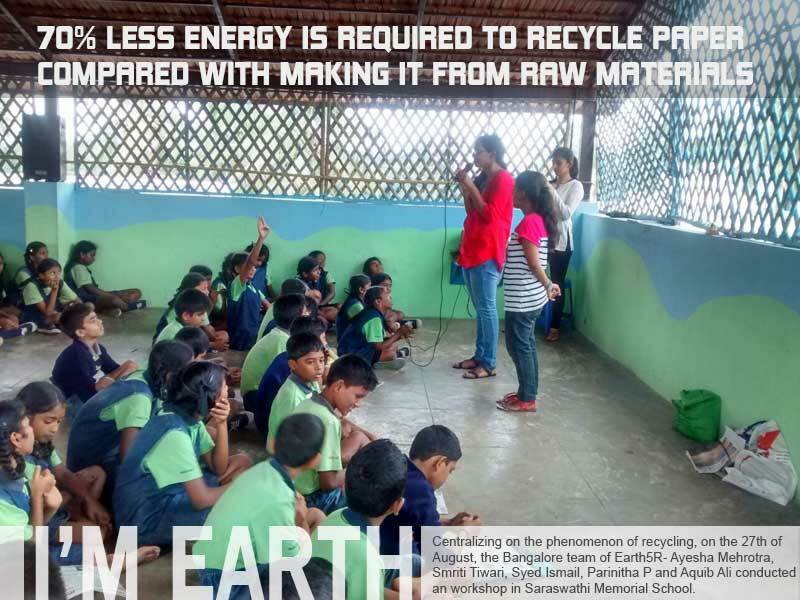 Inspired by this thought-provoking fact and centralizing on the phenomenon of recycling, on the 27th of August, the Bangalore team comprising of Ayesha Mehrotra, Smriti Tiwari, Syed Ismail, Parinitha P and Aquib Ali conducted an I’m Earth event in Saraswathi Memorial School, a government school managed by Parikrama Foundation. It was a small school but everything about the school as pretty big. 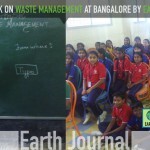 The way the kids conducted themselves, the way they were taught to call all their teachers, including their Principal- “Akka’s” and “Anna’s” (big brother and big sister in Kannada), having an e-waste box, naming classes by celestial bodies, their denim school uniform and most importantly, their knowledge about the environment. A lot of things seemed differently nice. We met three classes- 5th, 6th & 7th grades in their dining hall on the third floor of the school building. 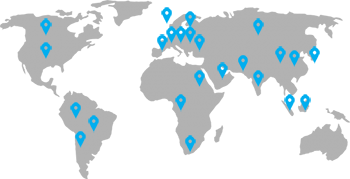 The classes were called Asteroid, Jupiter and Saturn, respectively. 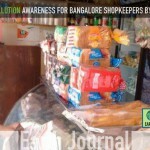 We first spoke to them about the organisation. When asked about the 5Rs in Earth5R, some boys cleverly looked at our bibs and promptly answered while the others managed to guess 4 out of the 5, all by themselves. 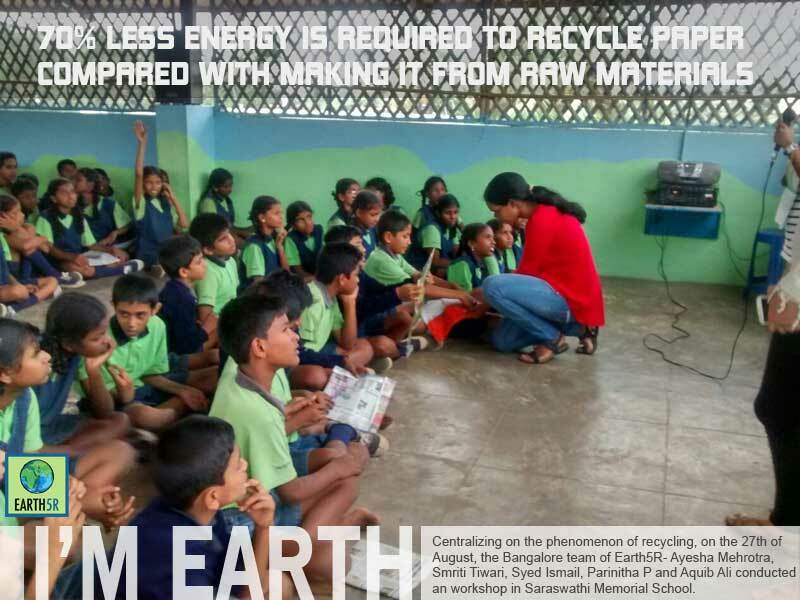 Our main aim was to spread the knowledge of recycling to the kids. Discussing the importance of recycling, we asked them questions about the usage of plastic. 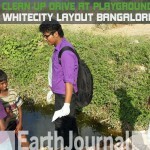 They shared their problems of garbage with us and we suggested what they could do about it. The best thing about this activity was the enthusiasm the kids showed; which probably comes with being kids. They were already so much aware about the environment that it was more of a discussion than us just motivating them to do their tiny bit of effort for the environment. We helped them make paper bags and they made all kinds. They made a folder, a tiny purse, one with the tricolour drawn on it and even a huge one with straps to sling it across the back! Even with limited resources, the kids didn’t show any lack of creativity. It was a very thrilling session. 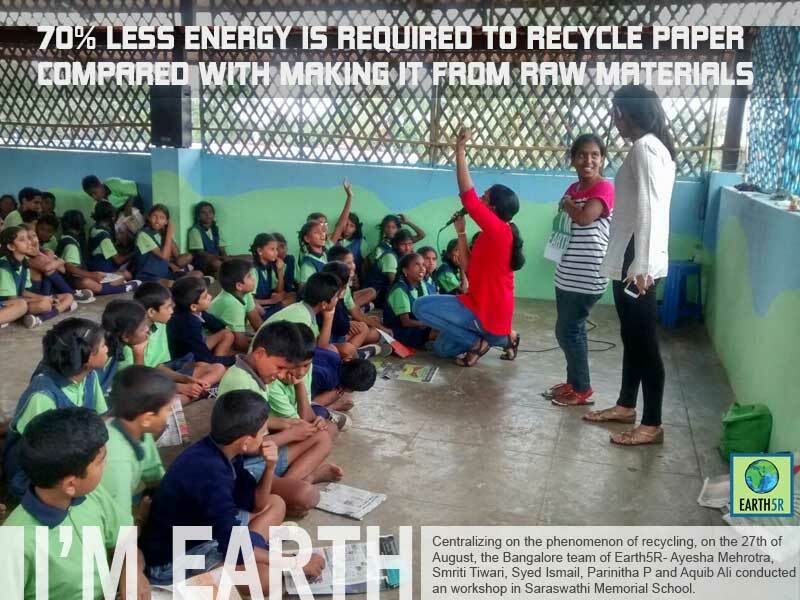 We learnt that schools can also play a major role in spreading awareness about the environment to the kids, but only if all schools did this, then we would have a vigilant and environmental-concerned generation. Many thanks to the principal, Mrs. Latha, and their class teachers, Ms Khushbhu and Ms. Kavya for supporting us all through the session and keeping the kids engaged throughout. 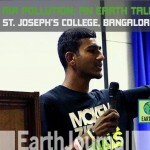 No Replies to "A workshop on recycling in Bangalore"